Rocking Paper: Make It Messy with Paper Mache | Fun, quirky DIY projects on the cheap – it's not just for kids! Fun, quirky DIY projects on the cheap – it's not just for kids! A brief interlude to focus on the written word turned into several months far too long. That’s no good. But it’s also in the past, like the rest of 2009, which can only be a good thing. So, here’s not so much a resolution but a determination: Do one thing every day that’s creative. “That scares you” is also an acceptable ending, but at the moment that’s a little high-art for the projects I’m planning. Because I’m me, I wound up trying to jump back into paper mache with a huge project, and now it’s been two and half months since the rabbit got his ears. He’s still sitting on top of my bookshelf, faceless and unfinished. That can’t stand either, but the first task should be getting my work space in order. It’s a madhouse in this apartment. There’s no room to do much of anything. Unless that thing is scribbling doodles in a blank notebook. Which happened this week: I started thinking about New Year’s resolutions, and then I got all excited about changing my life, and then I couldn’t sleep, even though it was right before my bedtime. (This is inevitably when the ideas come.) I want to try a series of very simple shapes — little house forms or boxes, most likely — and mix it up with some found objects and collage. I promise it’ll make more sense when I have examples. Or better sketches. First, however, I need to trade in the unfun mess, which has to go away before the fun one can really start. Thank goodness for a long weekend. Okay, this is an experiment. I decided to give video a try, and this is my first time with this, so your mileage may vary. A friend who I screened this for giggled a lot and very fondly told me I was a huge, adorable dork, so my hope is that you’ll be similarly kind. I was hesitant to put this up before finding out whether attaching the rabbit’s ears at this stage was a good idea or not, but what the hey, we’ll find out soon enough. Any artist can say their medium of choice is versatile, and the truth is that all of them are. You can make equally astounding and nonintuitive objects or images with clay, with wires, with painted canvases, with glass, with digital photography, with anything — the sky really is the limit. One thing that I personally enjoy about paper mache is how it can so easily be used for works of differing sizes. From a life-sized dinosaur to a small bead, it’s all game. When I was little, I always went right for the jugular. I didn’t want to waste my time with vases or picture frames or jewelry boxes — I wanted to make coat-hanger snakes and flying pigs and enough monsters to fill my parents’ house! And there are some ways in which bigger is easier for beginners. Subtle curves or little edges require a lot of patience and a lot of experimentation as you figure out what size strips (1 cm or less? yeah, I’ve done it) will preserve the shape you want without the final piece winding up full of wrinkles and loose edges. Another great thing about big projects is that you can really go crazy with decorations and mixed media. You’ve just made yourself an awesome canvas — so use it! I love the expression on this guy’s face. There’s something just truly turtley that’s been captured here. Day of the Dead will always, always produce totally fantastic pieces. You can’t lose with this holiday. God, I admit it. I am kind of a sucker for somewhat silly folk art. Simplicity of form can lead to really interesting and exciting final projects. I imagine you’re all a bit sick of my nondescript, earless rabbit by now: wait until you see how he comes out once he’s painted. Paint, of course, isn’t the only way to play with what you’ve created. This is sculpture, after all! I am beyond enthralled with the moon hanging on a wire here, not to mention totally charmed by the design. The whole shop is well worth a visit! Delicate is also more than doable with paper mache, though. I am less practiced with these forms, but I’d love to give them a try. My guess is that both of these were made with pulp, but I do know you can make little clay forms, paper mache around them, then cut them in half to scoop the clay out and seal up the bead. Have you found any paper mache on Etsy that blows you away? Leave a link! I’d love to see it. Happy hunting! There are a lot of joys I’ve rediscovered with this return to paper mache. One of the upsides is that I have every excuse to go to art supplies stores whenever I want. There’s a Blick location in the Loop on State Street, and it’s so easy to get sucked in. When I was little and growing up in Athens, Ohio, I used to go to the tiny art store in the basement of Ohio University’s college bookstore at every possible opportunity. Now I find myself getting terrifically excited at the sight of Liquitex acrylic paints or the smell of soft rubber erasers. Decorating this sucker is going to be a blast. I’m not there yet, though. The last bits of the rabbit’s base, its forelegs and underside, are drying as I type. I’ve found, for whatever reason, that blank newsprint, like the kind you get wrapped around terra cotta pots or framed prints for padding, dries very hard and so I’ve tried to make sure the rabbit as a whole has at least one to two layers of that. (It also dries very white, which gives the piece the neat effect of looking like it’s built of plaster.) I’ve seen other materials recommended around, and brown paper bags, dried cleaning wipes and matte fliers will certainly get a chance to prove themselves in future rounds. This seems like a good opportunity to point out that it’s not just the type of paper you use that makes a project stable by the end. Some people recommend using different types or sections of newspaper for different layers, so you can keep them straight as you go. For instance, you could alternate between the financial section, with all its columns of tiny numbers, and the lifestyles section, which is full of pictures and images and colors. When I was little and my dad got The Financial Times delivered, it was always gone fast, thanks to its weird orange tint. At the moment I’m pretty limited to the RedEye, Chicago’s free daily put out by the Trib, and the copies of Vive lo Hoy that no one picks up inside my apartment building’s lobby. No worries, though — so long as the piece is hard enough, no one will care once the painting starts. Hey, I never said I wasn't a dork. I worry vaguely that I’m going to turn into one of those bloggers that obsessively names and chronicles all her projects. Mostly, though, I’m trying to fend off my impatience and be zen about the whole endeavor. I jumped back into paper mache with a fairly complex project, one that requires making a solid base and ensuring that each subsequent part is well attached. This means making giant, satisfying leaps forward and then waiting some time for that segment to dry. I’ve got a good amount of paste left, and I’m still kind of in the zone, to totally sound like an SNL parody now. What I’d love to do is have another project I can start in on, just so I can have something else to do while the rabbit dries. I really am trying to be measured, though: if I’m not careful, I’ll have half a dozen unfinished forms cluttering up the floor in front of my kitchenette, and I do kind of need that space to exit my apartment. So, here’s my rule: if I’m not finished with one project, I don’t start on another — not yet, anyway, as I don’t particularly have anything I desperately need to make at the moment. This brings up a rather important point, though — a piece is done when it’s decorated. Great! Decorating is fun. (Except when it’s daunting: I couldn’t begin to explain why this tiny jewelry box is giving me such a block, although the day I choose between the portrait of Napoleon and the peacock for the centerpiece will be a good one.) One good thing to know is when to start decorating. What is the right time for moving beyond paste and paper? That depends on the project. Generally something with flat surfaces — your jewelry boxes, pencil holders, picture frames and pyramids — requires fewer layers than anything that has curves and bumps. Any project isn’t ready for decorating if it feels damp or cool to the touch in any way. You shouldn’t be able to bend or indent any part of it without effort. My rule of thumb is that if I can forget that it’s made of corrugated cardboard or a plastic bag stuffed with ad inserts, it’s probably ready for some dolling up. Sand your surfaces to even out the bubbles and blobs and get cracking however you best see fit. 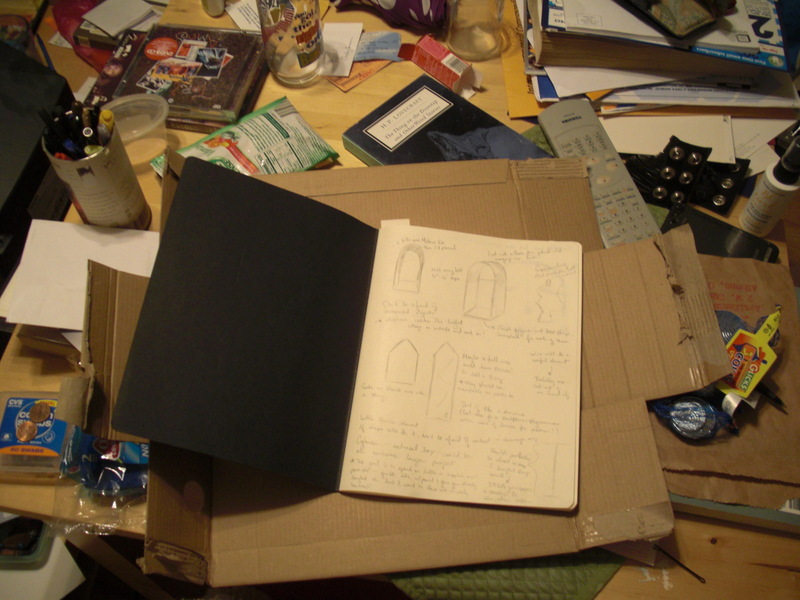 Maybe start sketching out some ideas for the next messy piece of glory you’re ready to build. Contemplate how much you love this part of the process while you read My hot glue gun by Shaina Feinberg. But only after everything — and I mean everything — is dry. It’s been slow on the actual “making stuff” front here for a while, but I promise this has nothing to do with waning interest or massive difficulty and everything to do with my magpie personality. I’ve managed to avoid further Etsy adventures (at least of the paper mache variety), and I’ve also been spending a lot of time gearing up for National Novel Writing Month in November, but every day that damn rabbit form had been staring me in the face from on top of my very small television, eyelessly pleading for the rest of its body parts. After coming away somewhat poorer from a gardening center today, I found that with a little scissor action, the plastic bags they gave me for my new pot and potting soil would do nicely for a protective floor mat. The thing is you can’t overthink these revelations when you’re graced with them, and so off to work on the semi-demi-rabbit I went. The feet make all the difference! What had been irritating me most was the rabbit’s feet. The front legs will go on after the base is really solid, as will the ears, but since the hind legs are essential to how the piece balances, I wanted to get those in place before I even put on my initial layers. They’d been sort of haphazardly taped into place, but that was easy enough to secure. A rabbit needs big paws, though, and that proved a touch trickier. The paws were formed from wadded up newspaper wrapped in masking tape (well, one was; the first is made of the tissue paper from the front of a pair of high heels — everything has a use), but they weren’t attaching very readily to the legs, made from two halves of a toilet paper tube. The way around this (and I really wish I’d taken pictures, but I appear to have been too pleased with myself to have thought that far) is chopsticks. You may have dozens of them hanging out in a drawer from take-out meals, in the vain hope (if you’re me) that someday you’ll master eating with them. These suckers are, craft-wise, worth their weight in gold. I took a very lightweight stick, cut it in half, coated each end with glue and poked it through the rabbit’s paw and its leg. As there’s no such thing as too much masking tape, I then secured it further, filling in any gaps with small crumpled pieces of newspaper. The top had already gotten a few layers, and the head was pretty much where I wanted it to be, thanks to drying it propped up against a soda bottle. With the legs attached, I was able to (ahem) attack the bottom. The rabbit bravely endured a somewhat undignified position for the sake of shoring up its lower half, and I was able to add some layers everywhere but the tip of the muzzle and the fronts of the paws. I’m quite sure no one overthinks quite like this, but to me it became kind of a fun exercise in spatial problem-solving. Your instinct is to approach the project as it will be when it’s finished, upright. But unlike clay, you have the ability to upend your piece, lean it against things, leave it out in odd positions and tackle it from a variety of angles without worrying too much if it’ll get deformed in the process. Two more notes before I sign off: first, notice how rough the layers are in the beginning. The rabbit’s head is covered with lumps and bubbles and and exposed ends and pieces of paper that aren’t lying flat. Don’t sweat it. This takes care of itself as the piece progresses. The more layers you add, the more uniform it will become. Be sure, though, that you’re smoothing out each strip as you lay it down. When it doubt, slather on a little more paste. This is why it's good to use protection. Make it easy on yourself. For now, I’m pausing just long enough to update and then start on my jewelry box while the rabbit dries. Happy crafting! One Chicagoan on a nonprofit's salary. One small apartment. One lifelong love of making cool stuff with flour, water, newspaper and the things you find lying around the house. Let's see what happens!